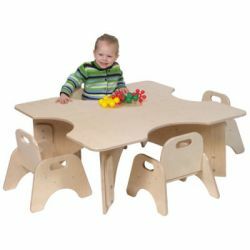 Toddler table has four cutouts. Height is adjustable from 14" to 19". Perfect for use with Stackable Toddler Chairs, sold separately. 36"W x 36"D. Weight 39 lbs. Additional shipping charges apply.